Whether you are seeking a product to replace a worn or damaged component in your vehicle, or an accessory to enhance your drive, Shop4Hella.com makes your quest simpler, and more rewarding! Not only will you find an exhaustive range of products from one of the world’s leading manufacturer of automotive safety solutions – all in one place – but also their benefits, dimensions, warranty information and customer reviews. Choose from a comprehensive range of products available for Audi, BMW, Volvo, Maruti, Honda, Hyundai, Mercedes, Honda and Hyundai. You can also compare features and specifications among variants so as to make the most informed choices. Shop4Hella.com is the official e-commerce portal of HELLA India. Find all HELLA auto parts - HELLA Bulbs, HELLA Battery, HELLA Horns, HELLA Head Lamps, HELLA Fog Lamps, HELLA Spare Parts & much more for 2, 3 & 4 wheeler. So the products you buy come with the assurance of originality, quality and reliability – at the best of prices. The portal also keeps you abreast of new launches, and exciting offers that make online shopping convenient and economical. HELLA is known for setting global standards for quality, customer orientation and has created a niche for itself in both international and domestic market as a supplier to leading vehicle manufacturers. HELLA has an experience of over 57 years of its presence in Indian market as it entered Into JV with JMA Industries in the year 1959. HELLA India Automotive Pvt. Ltd. (earlier known as HELLA India Electronics Pvt. Ltd.) was established as a 100% subsidiary of HELLA KGaAHueck& Co of Germany in 2005 by ending the JV PadminiEngg. Pvt. Ltd. and HELLA India Lighting Ltd. was established as 81% subsidiary of HELLA KGaAHueck& Co of Germany in 2005 by ending the JV JMA Industries. 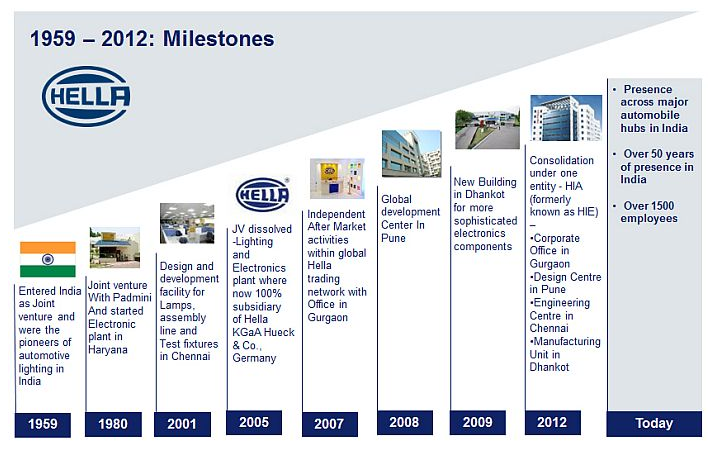 HELLA has its presence across major automobile hubs in India with five locations- two manufacturing locations in Dhankot, Gurgaon and Derabassi, near Chandigarh, one Global Electronics Development Centre in Pune, one Engineering Centre in Chennai and one Independent Aftermarket location in UdyogVihar,Gurgaon. 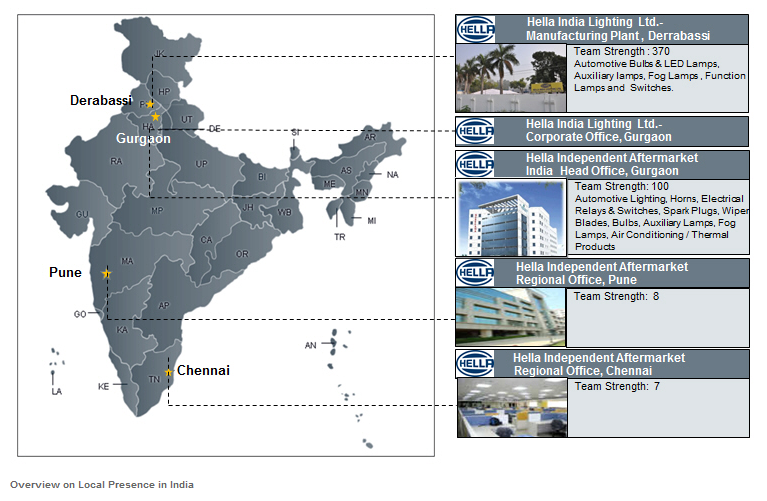 HELLA India has employee strength of over 1600 people. Hella introduces a comprehensive range of quality automotive parts and accessories, both for OEM’s and Independent Aftermarket. HELLA India Lighting Ltd. brings “Technology of Tomorrow for the Life of Today” to Indian Roads. Member of the Management Board of the HELLA Group, Germany, along with all employees of HILL, have adopted the new strategy for the company to focus all future activities around the central theme of ensuring road safety on Indian Roads. In this regard HILL focuses on state of the art technology products for the special OE segment and safety awareness campaigns through its strong independent Aftermarket network. 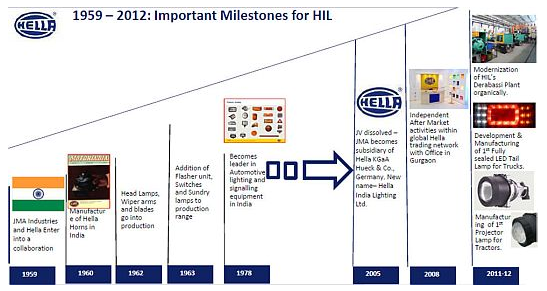 India is one of the focus markets for the HELLA Group and in the last years Hella India Lighting has turnaround its operations and thus earned the right to grow. HILL has achieved benchmark in quality performance and assured resource support for training and development of all employees to perform the “Technology Jump”. To operationalize the new strategy of HILL and to perform the “Technology Jump”, HELLA’s plant at Derabassi has gone through modernization and the plant has been equipped with latest machines and facilities. 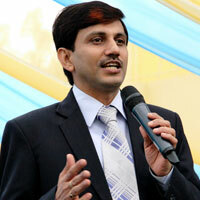 HELLA India Lighting has set up its company vision to impact the aspect of recognition. Moreover the company seeks to lower the number of deaths during traffic accidents by 10% by the end of this decade. The latest death toll figures show that there are almost 1 lakh deaths due to road accidents. This issue is of prime importance to HILL. The company’s vision is able to create and unlock a new value paradigm for end consumers. The safety cycle during night – to see and to be seen – is of great importance. Looking at the number of road accidents, the increasing death toll and the social and economic impact, HELLA is committed to road safety through its company vision. HILL has launched safety enabling products, tries to increase awareness of safety critical do’s and don’ts and actively engages with related non-governmental organizations and governmental departments. I am personally thankful to be part of this extraordinary culture of Hella India Lighting Ltd., where trusting our colleagues and challenging them to bring the best of each one of us, is an inherent behavior and a way of life. We all agree that HIL has an ocean of opportunities in India and we have miles to go before taking any rest. The evolution of the Company in last few years is both interesting and inspiring. It has witnessed a huge transformation of the automobile sector over the years in India. The Company has tried to deliver consistently best value to customers over the life cycle of the product and created a loyal customer base. The leadership team has built a culture of customer centric culture & empathy. I am indebted to the leaders in this Company for this strong and rich legacy. We executed the strategy of technology jump for our Products and manufacturing set up to become market leader in our relevant product technology groups. Our internal technology Jump was equally complimented by development of robust supplier base and their close participation in our strategic new product developments. With all these policies and practices, we are able to make ourselves different from the market and remain on the forefront of technology in Indian Auto-component market space. We also believe that with our all these innovative ideas we will achieve our vision and mission. Company has developed right platform to achieve the targets. Base is set with various product launches, favorable market indicators and stable government. With the focused approached, we are sure we will be able to touch new heights. I am also thankful to all of you for voting HIL as one among top 200 Great Place to Work For in India.